1 Heat oven to 120°C, gas 1/2. Line 2 baking sheets with baking paper, then draw a 25cm circle on one and a 15cm circle on the other. 2 Whisk the egg whites in a large mixing bowl with an electric mixer until they form stiff peaks. While whisking, gradually add the golden caster sugar, 1tbsp at a time, until the mixture is thick and glossy. 3 Spoon about two thirds of the mixture onto the 25cm circle, making sure there’s large dollops of meringue around the edge. Spoon the remainder onto the smaller circle, with large dollops around the sides. 4 Bake for 2 hours. 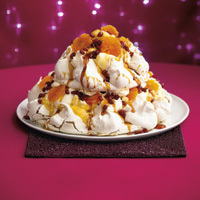 (If for any reason you don’t think the meringue is firm – cook for another 30 mins to 1 hour). At the end of cooking, turn off the heat and leave in the oven to cool completely. (These can be kept in airtght containers for up to 1 week, or leave on baking sheet, covered with cling film for up to 3 days). 5 For the filling, whip the cream, then fold in the icing sugar and vanilla. Add the passion fruit curd and gently swirl together to marble slightly. 6 Place the largest meringue onto your serving plate. Arrange some tangerine slices over cream, keeping lots for the edges. 7 Top with the other meringue. Spoon in the rest of the cream, and add the rest of the tangerines. Scatter over the pomegrante. 8 Put the white caster sugar in a deep pan with a splash of water and heat gently, stirring until the sugar has melted. Bring to the boil and bubble vigorously over a medium heat to give a dark golden caramel. Remove from the heat, then pour in the rum (it will splutter, so be careful). Don’t worry if the caramel seizes (firms up) – stir over a gentle heat and it will soften again. 9 Carefully drizzle over the rum caramel and serve within 2 hours.